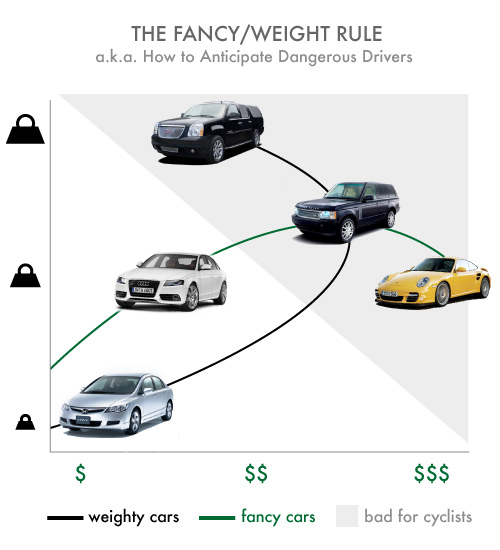 The fancy/weight rule states that as the cost and/or mass of a vehicle increases, its driver cedes proportionally more culpability for his or her actions on the road, with a special obliviousness reserved for cyclists. I found myself unwittingly in a proof last Thursday night when a certain Mr. Porsche cut in front of me to make a left turn; he had arguably not enough time nor space in which to do so. Extra points go to him for being on the phone. I’m 90% sure he was eating a sandwich in the other hand. Assign whatever classist reasoning you want to this argument. Clearly, your car doesn’t have to be big or expensive for you to drive it poorly. And I don’t mean to suggest that every last SUV driver takes pains to make cyclists’ lives uncomfortable. But one data point on this graph is infallible. It’s at the intersection where the two curves of cost and weight converge: Range Rover drivers are the worst. There’s just something about a Range Rover that offends my aesthetic sensibilities more than any other vehicle. Maybe I associate them with Christopher Moltisanti from the Sopranos. I hardly saw any RRs in Edmonton, but once I moved to RI, it seems like I see them all over town, driven by total jerks.